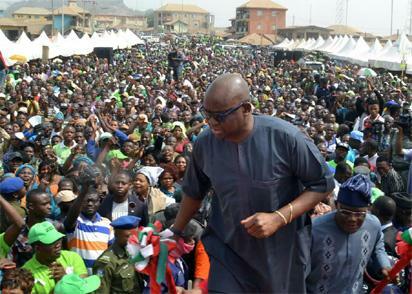 Governor of Ekiti State, Ayo Fayose has alleged that the continued insulgents’ activities in the country is a manifestation of internal aggression and not external one as everyone would believe. Governor Fayose, Who stated this in Ado Ekiti on Wednesday said that the government’s alleged failure to tackle the challenge of insecurity over the time and adoption of an option of paying ransom are indications that insecurity challenge has become an internal problem caused by those who are allegedly profiting from it. The Governor continued, ” We don’t have external aggression but an internal one. We are calling on the international community to look beyond Boko Haram or herdsmen. The international community should come for fact finding and dig deeper into the killings in Nigeria. “This is beyond what Boko Haram or herdsmen are doing. It is more of what the government have failed to do on time. Nigerians are becoming helpless. Benue people need international intervention, they need support. We want to believe that President has lost it. His approach has been cosmetic. ” How would you want us to believe that the Nigerian army cannot engage herdsmen, cannot engage Boko Haram. It seems that the reason for the coming of President Bubari to secure Nigeria has been defeated in all areas, corruption and fight against Boko Haram to secure Nigeria among others. “You can all see the situation, Nigerians are angry and hungry on daily basis as they are being killed by their own brothers. “I can’t understand why the federal government cannot take a stand to engage the so called herdsmen. They flaunt their weapons on the social media and the government look away. Currently, the APC led government led by President Buhari is paying lip service to the challenge of security of book Haram and herdsmen, ” he alleged. Fayose urged Nigerians to challenge the President to act decisively, saying, “steps must be taken, Nigeria must realise that if we fail to challenge the government on this, it would be a sad story for the coming generation. ” Personally, I am worried as a Nigerian, that we are no longer save in our father land. The president’ s visit to Taraba is simply political. After the President left Taraba people were killed. I can’t believe that after three months of the killings the President only went to the troubled part and spent only one or two hours and left. It is unfortunate. Asked if the governors’ forum has advised President Buhari on what to do, he said: ” The Governors Forum is not the Commander in chief of the nation. The present government is not taking advice. How do you explain a situation where our president is saying governors should tell their people not to block cattle route in this twenty first century? When we are faced with the challenge of people carrying AK 47 in the name of rearing cows. We are talking of cattle routes in the 21st century! The defence for cows has become more important than that of human beings. ” The world has become a global village, Nigeria is not isolated. When this matter is well probed. We would see that it is beginning to look like a business. Some people seem to be promoting this war because they are gaining from it. Some have turned it into a business. People saddled with the responsibility of protecting Nigerians have turned it into business. ” The insurgency plaguing Nigeria now is an internal problem not an external aggression. The president as the Commander-in-Chief should find solution to this challenge or resign for incompetency. ” I am also advising the youths to get well involved in politics and take over power from the old folks. We should stop paying ransom because this is becoming like a business. “That is why we kicked against the move to take $1billion from the Excess Crude oil account. When we continue to pay ransom we won’t get anywhere. We are paying 2million Dollars for somebody. So what is the essence of the fight by the Nigerian army?the corruption in the system is encouraging this war. People are promoting this war at the expense of the lives of Nigerians, ” he said. 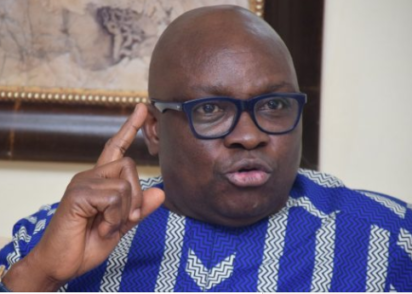 The post Buhari’s APC got paying lip service to Nigeria’s security challenge – Fayose appeared first on Vanguard News.